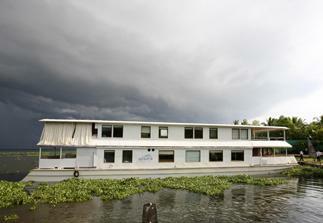 Apsara Cruise Liner is located on the Vembanad lake with The Park on the Vembanad Lake Resort as the docking station. This is a tour package offered by the TSI Holidays for 3 nights and 4 days. Read through for more details of the itinerary and Contact Details. Apsara Cruise Liner is a floating boutique hotel which has 8 cabins, a crew cabin, a galley, saloon, dining area and a sundeck. The rooms in the liner are compact with LCD Televisions, DVD Player, Safe deposit lockers, Minibar, high-speed internet connectivity and a wide range of books, music and films. The rooms Display individual works of art and the rooms have a double bed, study desk and chair as well as a bathroom. Day 1 - At around 12 pm you will be welcomed in to The Park on the Vembanad Lake and will be transferred to the luxurious liner MV Apsara , a Heaven On Water. The Apsara sets sail at 1 pm and heads to the north of the Vembanad Lake via Thaneermukkam, famous for the salt water barrier dam and its ancient temple. Meanwhile lunch will be served on board for you. You will also pass through Kumarakom Bird Sanctuary - a cluster of islands that is an ornithologist's delight. You could consult with Ayurvedic doctor who is present at the liner to discover your Prakruthi or the body type. He will also tell you about the likestyle and the best suited cuisine for you. Overnight stay onboard at Apsara Cruise Liner. Day 2 - Breakfast on board the cruise liner as it sails through the Punnamada Lake which is place of Nehru trophy boat race. You will go past the finishing point of the boat race and dock at Kanjipadam Village with its rice fields, cackling of the goose and the ducks. There is a 100 year old temple, Sri Bhagawathy Kshetram, with Bhagawathy as the presiding deity. The temple hosts a 5 day ritual every year. You can mingle with the villagers there and learn more about their likestyle and traditions. Laer returnto the liner at about 10.30 and set sail for Champakulam known for the annual snakeboat race and the oldest market in this area. This is also a craft and coir villge, you can walk through the paths and lanes of the Champakulam village.There is a alsoa ancient St. Mary Florence Church built in 1870. You will return to the Apsara Cruise Liner for lunch and then proceed through the Pampa river. Meanwhile a traditional astrologer reveals your planets and the influence of them on your life. You can have a chat with him about your future or just watch the sky for the different varieties of birds , water and the sky as you sail back to The Park on the Vembanad Lake Resort. Evening will at leisure , cocktails, dinner and entertainment at the Vallom like the first day. Stay the night at the Apsara Cruise liner. Day 3 - will see you sailing towards R block which is the rice bowl of Kerala to reach Punnamada Jetty. Shikara boats are arranged for you to see and experiance the highlights of the Punnamada area. There are small islands in these canals , with a view of the coconut and paddy fields Chinese fishing nets and Toddy tappers. These Islands are bordered by mud walls which are remniscent of dykes of Holland, the few places where under water farming is done below the sea level. The area is also known for the migratory birds. Return to the liner for lunch and watch through a salad demonstration by the chef. Meanwhile you will be sailing through Chithira Kayal to see more of under sea level farming. You can also see a floating market with local Kerala craft – a collection of local jute handicrafts, hand-made soaps, exotic spices and pickles, banana chips (a local specialty), and other artifacts which the shopkeeper has to offer. 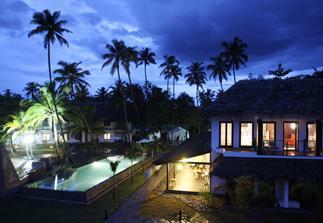 Return to The Park on the Vembanad Lake Resort, evening is leisure time. Cocktails and dinner at Vallom and the night stay is at Apsara. Day 4 - at 7 am you will set sail for the last time on this tour, to sail close to the Pathiramanal island which uninhabited . This is a bird watcher's paradise. You can find more than 90 local species and 50 migratory boards, you may catch glimpses of the pintail Duck, Common Teal, Night Heron, Cormorant, various types of Egrets, Jacanasth Cotton Pygmy Goose and the Whiskered Tern as well as the Monarch flycatcher can also be spotted. You will then return to The Park on Vembanad Lake by 9:30 am, ready to get on with your onward journey. Every evening you can dine at the open air dinner area in "Vallom" at The Park on Vembanad Lake, accompanied by a live performance or a cultural talk. Before that you can just sit through and explore the stillness around you by relaxing by the Pool and watching boats go by or even indulge in the idyllic pleasure of fishing. There are the rejuvenating and elaborate treatments at the tented spa – Aura and you could stretch yourself – body and soul – through the evening yoga sessions or a workout at the Gym. As you come away from your Apsara experience, you would wonder how it got so calming and restoring, such an adventurous exploration and how could four days have created so many memories to take home. Kerala is a place known for the natural beauty and the lush green paddy fields, grassy meadows and plantations etc. and treks and walks through the majestic looking western ghats. Here is a club you can join for these Eco trips and walks, they have hill resorts, homestays, plantations and many more places to visit and stay at their associate member resorts and homestays etc. Read through for more details about the club and their unique offer for the members.